Increase productivity, maximize revenue, and take better advantage of growth opportunities. 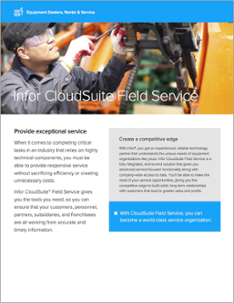 Infor CloudSuite Field Service is the deepest, most industry specific service management solution on the market today. It helps service-centered industries deliver better equipment service, resolve problems faster, and manage the entire service process more efficiently.